The average fuel economy of light vehicles sold in the U.S. was down 0.1 mpg in June, according to the University of Michigan Transportation Research Institute. The average window-sticker value of new cars, SUVs, vans and pickups purchased in the U.S. was 25.4 mpg in June, down slightly from 25.5 mpg in May. “The decline likely reflects the increased sales of light trucks and SUVs in June,” UMTRI researcher Michael Sivak said in a statement. June is the 17th consecutive month that average fuel economy has been at least 25 mpg. The average fuel economy of new vehicles has increased by 5.3 mpg since the institute started keeping track in October 2007. 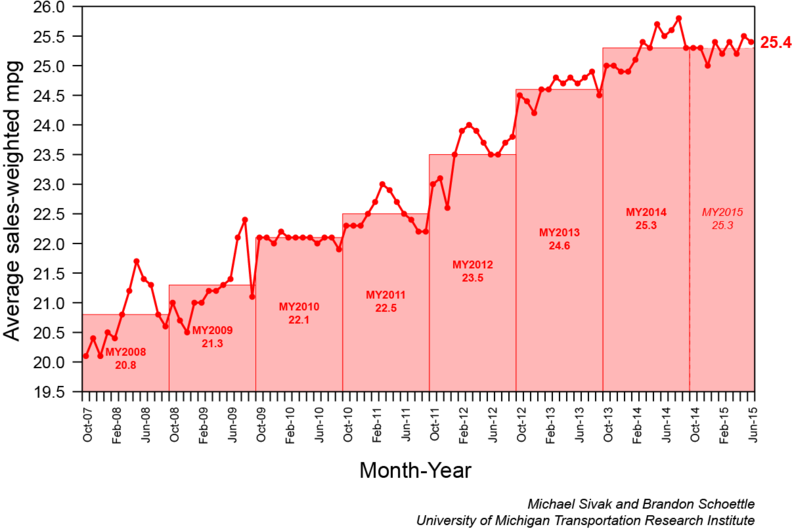 June’s fuel economy average is still slightly below the record of 25.8 mpg set in August. The institute also tracked the average monthly greenhouse gas emissions of each new-vehicle driver in the U.S. during April with its Eco-Driving Index. The EDI takes into account both the fuel used per distance driven and the amount of driving done in the month studied. In April, the EDI was up to 0.85. This is the worst EDI score since December 2011, but the average emissions per new-vehicle drivers are still down 15 percent since the institute started keeping track in October 2007.